By John Kruzel, Manuela Tobias on Monday, October 1st, 2018 at 5:44 p.m.
President Donald Trump announces the United States-Mexico-Canada Agreement, or USMCA, on Oct. 1, 2018. 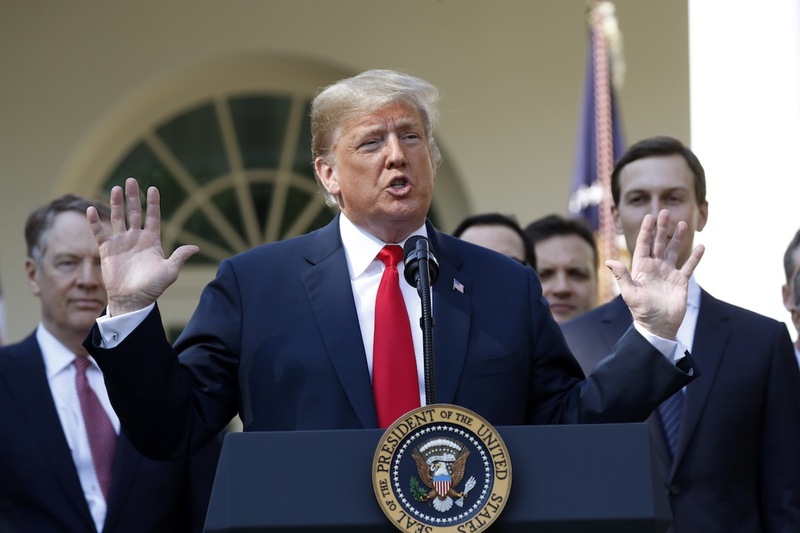 President Donald Trump hailed the new United States-Mexico-Canada Agreement as an even-handed substitute for the North American Free Trade Agreement he has long criticized. The deal, if approved by Congress and the legislative bodies in Canada and Mexico, would take effect around 2020. But Trump wasted no time claiming victory on a campaign promise to renegotiate the trilateral trade deal he has blamed for hollowing out the American manufacturing sector. "It is a great deal for all three countries," Trump said during an Oct. 1 ceremony in the Rose Garden. "It solves the many deficiencies and mistakes in NAFTA, greatly opens markets to our farmers and manufacturers (and) reduces trade barriers to the U.S."
We looked through the blueprint and reached out to experts to get a better sense of what it does. Here’s a rundown of the new NAFTA, which Trump has nicknamed the USMCA. How does this affect makers of car and truck parts? The deal touches a variety of economic dimensions. It increases the United States’ reach into Canadian milk and pharmaceutical markets, bolsters labor and environmental rights and broadens protections over intellectual property. Perhaps most significantly, it aims to substantially increase the share of car and truck parts made in North America. It seeks to do this by raising the proportion of North American parts and inputs that must be used in a car for it to qualify for duty-free treatment. Under NAFTA, a little less than two-thirds of a car’s parts had to originate from North America for the car to be eligible for duty-free status. Anything short of that, and the car is not considered a "North American good." The new agreement raises that threshold, with cars needing three-fourths of their parts originating in North America to move freely between the three countries. The change to the so-called "rule of origin" provision incentivizes automakers to rely more heavily on North American-made parts and inputs. This could give North American auto part manufacturers an edge in North America against foreign competitors, said Jonathan Doh, a professor at Villanova University School of Business. "From the perspective of automaker and suppliers who are regularly importing parts outside of North America," Doh said, "it’s a pretty significant change." The new deal also requires that at least 40-to-45 percent of the value of vehicles be produced in factories paying $16 wages by 2023. That’s significantly higher than Mexico’s minimum wage, roughly $4.15. Under NAFTA, no such wage provision existed. How will this affect tariffs on dairy? For months, Trump has complained about Canada’s high tariffs for dairy products. At the press conference, he said the dairy market had "opened up much more" to American dairy producers. The new deal allows the United States to supply the equivalent of 3.6 percent of Canada's dairy market tariff-free, up from the existing 1 percent. It also eliminates a milk ingredient pricing policy that incentivized Canadian cheese producers to use local ingredients. American wine producers will also benefit from grocery store shelf space in British Columbia, which was previously inaccessible. Canadian Prime Minister Justin Trudeau said the deal was limited to small wins for Canada, which included keeping the existing provision that puts an independent body in charge of resolving trade disputes. Canada, in turn, failed to secure protections against the mechanism that allowed the Trump administration to impose aluminum and steel tariffs. What does this mean for everyday Americans? The Trump administration touted the agreement as a boon for the American middle class. But aside from the rules concerning car parts and wage rates, the changes represent mostly a symbolic shift, with the deal making most of its impact felt "on the margins," said Doh of Villanova. Its economic consequences may also deliver a more mixed picture than the rosier portrait painted by the Trump administration, he said. More locally sourced labor and higher wage requirements represents a win for American workers in the auto industry. But a greater reliance on North American-made inputs, which can be pricier than their foreign-made counterparts, may have the effect of raising prices on American consumers. The deal is expected to take effect around the start of 2020. Before that happens, there are a number of hurdles that require clearing — and in the meantime, old NAFTA is still in effect. The remaining work on the deal will follow a structured framework. The three-way deal was reached Sept. 30. That same day, the text was made public. That began a 60-day countdown until the agreement is formally signed. These 60 days represent the final leg of the negotiation phase. During this 60-day period, American interest groups and local governments are given the chance to weigh in. After the agreement is signed, the Trump administration will work with Congress to identify any changes to U.S. law that are needed to harmonize with the international deal. The final process involves Congress considering the deal and, if passed, implementing it.